Urban Pioneering Architecture believes that every successful project begins with a client’s vision, unique architectural conditions, and a desire to create something timeless. Famous for its striking modern designs and meticulous additions to historic buildings, this Brooklyn-based architecture firm is nationally published. Delson or Sherman's diverse portfolio combines clean, understated design with careful space planning and original detailing. In place of a signature style, we focus on the unique opportunities of each project, researching new products and old materials, and engaging clients in the design process. To this end, we provide comprehensive architectural services: from helping clients imagine possibilities to on-site involvement in construction. Perla Delson and Jeff Sherman founded the practice in 1997. Both are licensed Registered Architects and LEED Accredited Professionals. New York Area Architect & Designer Best Of Houzz 2014-2018! 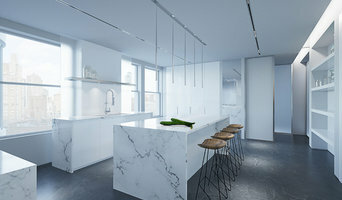 Modern mid/high-end apartment renovations primarily in New York City with meticulous attention to material selection, detailing & lighting-creating unique sculptured spatial design solutions. Horrigan O'Malley Architects offers a comprehensive range of innovative and custom architectural services, including master planning, site planning and urban design. We are a small, Brooklyn based architecture and design-build firm. We work collaboratively with our clients and craftspersons to create appropriate and enduring projects. R. A. Somerby's diverse projects combine proven techniques with a forward looking aesthetic to achieve contemporary living spaces that withstand the test of time. Lindsay Architecture Studio, P.C. provides full architectural services, managing an appropriate team of engineers, media and lighting experts suitable to a given project. Based in Brooklyn NY, Baxter Projects is a modern architecture firm dedicated to working closely with our clients to discover unique solutions that are both aspirational and practical. We are a design-oriented, full-service architectural practice established in 2006. Our approach is thoughtful, collaborative, inquisitive and reflective of deep beliefs in what constitutes good design. We believe that design affects people's lives in ways that are deeper than aesthetics. We create environments in which life stories unfold. We believe we have a responsibility to create thoroughly good design. And we believe that every good design starts with a clear understanding of function and use, consideration of the surrounding context and and a deep appreciation of client direction. We believe in embracing complexity. Many factors affect design - the client’s needs, tastes and budget, the existing context, both historic and physical, the talents of each member of the design team, the need to be as judicious as possible with our natural resources, as well as technical considerations such as building systems and code constraints. We believe that it is the architect’s task to dig deep and extract the essence of these influences and then synthesize these factors into a functionally and aesthetically coherent work of architecture. We believe philosophically that all aspects of any project need to be synthesized by the architect into a coherent whole. Therefore we offer our clients not only our technical expertise, which includes planning, code compliance, municipal filings, coordination of building systems, observation of construction, etc, but also our design expertise, which includes developing the aesthetic and spatial and tactile qualities of the building. KDA is a full-service architecture and design firm specializing in high-end residential, boutique commercial, and development consulting. CADKAY is a full service Architectural Firm offering a variety of assistances to suit our Client’s specific needs. We offer custom home designs and much more. Since its inception in 1987, the firm has specialized in residential landmark restorations and renovations while offering a full complement of services -- from new construction, additions, alterations, apartment and loft combinations, and building conversions, to new development of office space, retail stores and institutional facilities. Each project is a collaborative effort by a group of artisans working towards the successful completion of the client’s goal. John H. Hatheway Jr., and those associated with his firm, join together to ensure that the full potential of each assignment is realized. Richard Mass Architects is a complete architectural and design firm with extensive experience in both residential and commercial projects. We are a multi-disciplinary architecture & design studio, with over 12 years of experience in a wide range of project types & scales, specializing in integration of architecture & interior design. As a licensed & fully insured construction & renovation company, we are proud to say we provide the best in renovations for our customers no matter the size of the project, client or budget. Matthew Viederman established his practice in 1998 after working in Paris for 7 years on numerous prestigious projects. From 3D Design to project completion, we will be there every step of the way. CHI works with clients to articulate their needs and preferences, plan projects that can be accomplished with the resources available and shepherd them through to completion. New York's Architecture and Design Best of Houzz 2015, 2017 & 2018! Shenker Architects provides services in building design, construction management and interior design. The firm is striving to solve clients' needs with innovative design, taking responsibility for most intricate space planning, technical and aesthetic tasks, all within realistic budget and schedule limits. The firm offers extensive experience in a broad spectrum of architectural project types ranging from affordable to high-end residential, from medical clinics and corporate offices to restaurants and retail, from religious facilities and concert halls to manufacturing buildings. The design philosophy of the firm is based on a strong persuasion that great buildings are built by great teams, where the Client, Architect and Builder must have a sense of mutual achievement, as well as inspiration which allows us to create something special. All projects receive personalized professional service from inception through occupancy. We design buildings as a whole system where the exterior logically rises from the inner spaces meanwhile the interior rationally reflects it's surroundings. We strive to pay attention to every detail and building element, as well as to consistency of design throughout the whole project. We are strongly convinced that for a projects success an architect's involvement is critical from the time of site consideration and far beyond construction completion. 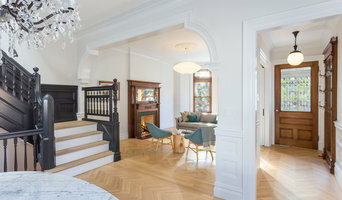 Since 1995, CWB Architects has steadily grown its practice from a two-person shop focused on historic row house renovations into a multi-disciplinary architecture, preservation, and interior design firm with projects throughout Manhattan, Brooklyn, Westchester, New Jersey, Connecticut, and the East End. Our strengths lie in residential architecture adapted for modern living, and commercial and institutional spaces crafted for collaboration and productivity. Adept in historic renovation and modern design, our substantial practical experience and sophisticated design sensibilities ensure imaginative solutions that, in the end, seem effortless. As a mid-sized firm, we have the ability to provide daily, hands-on project management at the principal level. Our collaborative team consists of three principals, supported by 25+ talented associates and staff. In addition, we maintain relationships with qualified consulting engineers, expeditors, and other specialists in the construction industry. We have extensive experience in the renovation and adaptive reuse of buildings of all types with a particular strength in landmark districts. Condition - an architectural design studio based in New York focusing on a broad range of scales and typologies of buildings and interiors. Cluck Design Collaborative is a Charlotte-based architecture firm born out of a mutual respect for bespoke solutions and making design accessible. Kimberly believes that the dialog between client and architect is crucial to the architectural process. In residential projects analyzing and understanding the client’s lifestyle informs the design. Brooklyn, NY Architects are masters of building design and can make your dream house a reality. Perhaps you would like to find Brooklyn, NY architects to help you extend the kitchen and install bifold doors opening out onto a newly landscaped garden? Maybe the challenge is a loft conversion but you’re not sure how to make the most of the limited space up there? You might even wish to hire architects in Brooklyn, NY to help you build your own house from the ground up. Architects can help you to get a clearer idea of what is possible, both in terms of the land you own and the budget you have. They have extensive knowledge of architectural design, construction methods and building materials, not to mention a strong appreciation of ergonomics – warmth, light and flow within a property. Architects will also be far more capable of seeing the bigger picture – carefully balancing aesthetic appeal with structural safety – and navigating all those little steps from concept through to completion. And with their local knowledge, your Brooklyn, NY architects will also often help to obtain planning permission and building regulations approval. How do I choose the right Brooklyn, NY architect? Begin by determining the type of architectural service you require. Is it merely advice that you need? Or a detailed set of architectural design plans? Are you hoping to add a single-storey extension or are you really looking for someone to design you a custom home and handle construction management right through to completion? One of the most important duties of full service architects in Brooklyn, NY is to serve as project managers and supervise most aspects of construction as well as facilitate communication between all other contractors. Architecture is an incredibly technical profession and one where getting things wrong can literally put lives at risk, so do background checks on your Brooklyn architect. Check they are registered with architecture associations such as the Architect’s Registration Board (ARB) and The Royal Institute of British Architects (RIBA). Being part of an architecture association means that an architect or architecture firm has met certain standards, qualifications and practices, and can be held accountable if they don’t meet these standards. It’s advisable to choose architects that specialise in the kind of project that you are undertaking as their existing experience will shine through in the completed design. Look for an architect in Brooklyn, NY that can provide references and reviews of their previous work. Once you have determined the service level you need, your next consideration will be architectural style. Some architects specialise in designing for traditional housing such as period cottages and country homes, or even in designing modern replicas in a period style. Others have a knack for imagining bolder, more futuristic architectural design in Brooklyn, NY incorporating the latest green technology. Check their Houzz profile and website for examples of previous work. Early on, try to gauge availability – there’s no point in choosing an architect that’s going to be booked for months if you have a tight deadline. Some architects are happy to do all their work online or over the phone with you, but if you’d prefer to work with an architect in person then check that your chosen architects in Brooklyn, NY will travel to you. At the first meeting, preferably at your property or building site, give as clear a picture as possible of the kind of home you are trying to create to your architects. Chat through your goals, projected budget, scope of work, schedule and feedback, together with any very specific requirements you might have. It is crucial that your architects are clear about their responsibilities and that these are documented in the contract. Ask them to walk you through the process, including the number of architectural design consultations, site visits and what they will be delivering and when, e.g. feasibility study, a technical drawing, tender package and/or planning application drawings. They could illustrate this using a previous client’s project. Also, what does the architect need from you? Deeds, rights of way, deposit, staged payments etc. Once you have covered all this detail, you are ready to make your choice and get started. The architecture company in Brooklyn, NY that you hire will likely start with concept drawings and finish with construction drawings and documents. Some firms even design with 3D renderings, CAD and videos, but this is by no means essential. You are looking for architects in Brooklyn, NY that have the right balance of creative flair, technical nous, practicality and impeccable service to see you through. Get a sense of whether they are a good listener, collaborator and problem solver. Checking their references will also be invaluable at this stage so look at their Houzz profile for past customer reviews. Ask to speak to previous clients, particularly regarding their responsiveness and ability to work creatively around a budget. There is no set payment structure for an architect. Some Brooklyn, NY architects will charge an hourly rate, others base their fees on a percentage of the total construction cost or propose a fixed fee (payable in instalments) for projects such as house extensions or a complete home design. You may wish to pay in stages to safeguard against any possible dissatisfaction with the quality of service. Make sure the total figure and payment schedule is agreed as part of your contract, particularly if you are trying to accurately estimate the cost of building a house. What are the important questions to ask architects in Brooklyn, NY? How long have you been an architect in Brooklyn, NY? Are you part of ARB and RIBA? Are you part of any other associations of architectural design in Brooklyn, NY? Find architects in Brooklyn, NY on Houzz in the Find a Pro section today. Start by browsing the architects and Brooklyn, NY architectural design firms near you and assess their reviews, latest projects and contact details.